Most modern compressors analyze the input signal to control gain reduction. This is known as a “feed-forward” topology. The TDR Feedback Compressor II, however, analyzes the output. This approach delivers unobtrusive and highly musical compression characteristics which mean the compressor is able to handle complex signals with ease. Super fast and natural sounding compression. Dubstep is an exciting style of music that lends itself to a lot of creativity and the powerful use of plugins and virtual instruments of all kinds. 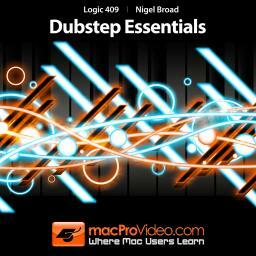 Nigel Broad, a chart-topping dance producer, knows a thing or two about Dubstep and in this Logic tutorial he creates a full-blown Dubstep track, starting with the drum programming and evolving all the way through the final mix. This 25-video class starts off with Logic’s mighty Ultrabeat drum machine, where you’ll learn to set up, program and tweak a killer Dubstep drum beat. Nigel is the ultimate Ultrabeat and Logic master and shares his hit-making tips throughout this tutorial. What’s a Dubstep track without a Wobble bass? Using the ES 2, Massive and RAZOR, Nigel shows you how to create a composite bass line that will blow you away! Next he conjures up some cool pads, leads and SFX that really make the track shine. Finally, Nigel wraps it up by talking about song structure before he mixes and masters his custom track. 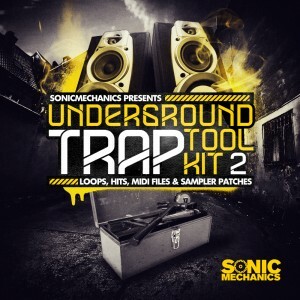 Sonic Mechanics presents UNDERGROUND TRAP TOOLKIT 2, a compilation of loops, instruments, one shots and presets, including a custom Kontakt 4 instrument, Massive patches and Stylus RMX compatible Rx2 files. These loops and hits have been designed for trap producers construct their next stunning club hit with ease. Each sound has been sculpted to give producers striking synth lines and 808 subs with pump. The pack contains multi format options, including patches for Native Instruments Kontakt 4+, EXS24, Halion, Soundfont 2 files and single hits to use in all major samplers. The main Zip folder contains a total of over 2GB of data so every producer should find essential sounds that can be customized to suit their unique style. The loops take their inspiration from artists including Baauer, Gladiator, Carnage, Major Lazer, Flosstradamus, Luminox, Brillz, Uz, Krueger and Diplo and are created to provide an genuine underground trap essence to your creations. Each kit has been separated to include each individual building block, allowing the ability to assemble customized loops with ease. There is also a custom Kontakt 4 instrument with a heads up waveform display and Gui interface with controls for Filter parameters, Reverb and more. This Kontakt interfaces allows for tempo synced usage of the loops as well access to each individual slice. The Sonic Mechanics team aims to make the producer’s life as easy as possible and each sound has been through a quality control procedure to make sure that only the highest quality audio files are included in the final cut. Although originally designed for the Trap genre the sounds are perfectly suited to Trance, Grime, Krunk, Drum and Bass, House and Breakbeat and with an creative mind the samples within can find a home in any musical style. Adding these kits to your collection will guarantee that you have access to a large reservoir of hits and loops insuring your next production will have the fundamentals to create the next top charting trap banger. The samples are in 24 bit wav format and include Tempo and key information where necessary. 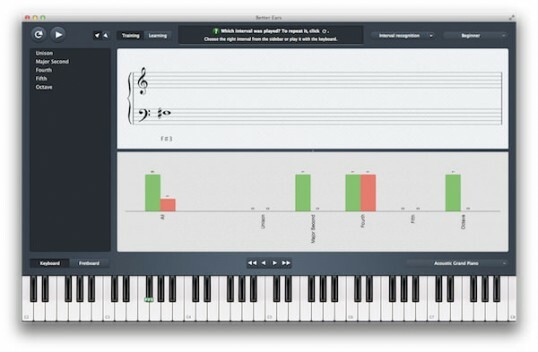 Better Ears Beginner« is the free version of »Better Ears«, an educational music and ear training program. »Better Ears« helps you grow your musical skills and enhance your hearing capabilities. There are ten different exercises included, starting from interval recognition all the way to chord progressions – perfect for beginners and music-masters alike! Better Ears supports Retina Displays. »Better Ears Beginner« has all the features of »Better Ears«, but is limited to one level and one instrument. You decide how to train! With »Better Ears« you can decide for yourself what your training routine should look like. There are no rules you have to follow, you decide when to start and how often to practice. 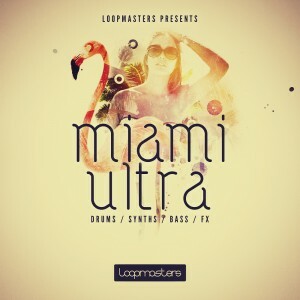 Miami Ultra from Loopmasters takes inspiration from the Mainroom & House line up at this year’s Ultra including artists like Carl Cox, Deadmau5, Pete Tong, Eric Prydz, Fedde LeGrand, Booka Shade and labels such as Toolroom and Bedrock. Weighing in at 762Mb in size and featuring 663 samples, all recorded at a pristine 24Bit quality, and featuring 389 Loops, and 274 one shot samples – this is a great and diverse collection of 100% royalty free sounds. Also included are 34 ready to play for Reason Nnxt, Halion, Kontakt, EXS and SFZ compatible soft sampler patches. Apple Loops, Reason Refill and Ableton Live versions are also available to purchase separately. In detail – the Miami Tech exclusive sample pack from Loopmasters includes 120 Chunky Bass Loops, 42 Club Ready Drum Loops, 42 Top Loops, 42 Percussive Loops, 95 Lush Pad Loops, 131 Punchy Drum Hits, 5 Bass Multi Sampled Instruments, 4 Lead Multi Sampled Instruments. 4 Pad Multi Sampled Instruments, 40 SFX Shots, 389 Rex2 Files, 262 MIDI Files and 34 Soft Sampler Patches. 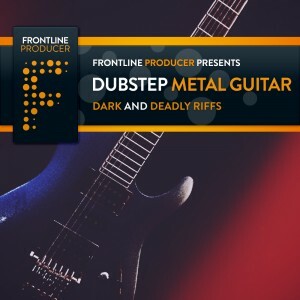 “All hail the Overlord of Metal” as Frontline Producer proudly presents Dubstep Metal Guitar, a brand new collection of dark and deadly guitar loops, pulled from the pit and ‘tune ready’ for producers worldwide. For the last few weeks here at Frontline HQ we’ve been recovering in a very dark place indeed, as Dub metal guitar was spawned. All we had to do was cautiously press record. However, enough of the effort, headaches and bleeding ears that went into the creation of these masterpieces from below, what you actually want to know is what to expect in this metal monstrosity. Yet again we have combined the finest Players, instruments and recording kit to squeeze these samples into another bite size beauty to inspire you to get creative. If you’re looking to add serious metal riffage this pack is certainly for you. In detail expect to find a total of 160 loops lovingly recorded 24Bit, 44.1Khz weighing in at 233MB with 160 Guitar Loops in Wav and Rex2 Formats in tempos of 90, 110, 140, 150 BPM. The pack is also available in an Apple Loops version to purchase separately. The pack is also available in an Apple Loops version to purchase separately. 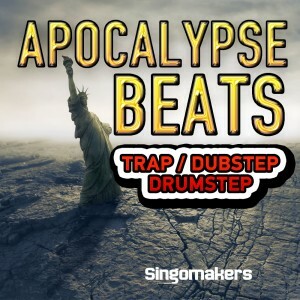 Singomakers are proud to present this atomic collection of Drum Loops for Trap, Dubstep and Drumstep! This outstanding sample pack includes 300 Beats for Trap, Dubstep and Drumstep + great bonus folder with Percussion Loops and bass/synth loops that been used in demo track! In detail expect to find over 1 Gb of samples of 24 Bit quality, including 100 Trap Beats at tempo 150 BPM, 100 Dubstep Beats 140 BPM, 100 Drumstep Beats at 175 BPM + 100 Percussion Loops and 400 REX2 Files! Suitable for all producers of Dubstep, Trap, Hip Hop, Complextro, Drum & Bass, Drumstep, Jungle, Glitch Hop. This sample pack created by Damasko, author of bestselling sample packs Evil Dubstep Sounds and Epic Movie themes, so you can be sure, these Apocalypse Beats will make your neighborhoods go crazy! Check the demo of sample pack and be sure that “Apocalypse Beats” pack is the must have collection for today’s cutting edge producers! Here is a great trick for making your drums sound really big and it’s simple to do. It’s called Parallel drum compression. 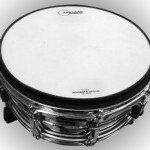 The onHEAD by Aquarian Drumheads Turns any snare drum or tom-tom into an amazingly quiet, yet expressive electronic drum pad. The power of Aquarian’s advanced inHEAD FSR technology, combined with the proprietary “New Bounce” playing surface produces an E-drum pad with extreme sensitivity and wide dynamics while eliminating any crosstalk or false triggering. The onHEAD P.E.D is made to be placed anywhere: on a stand, on a drum, on a table or in the hand. The onHEAD can be used with mounting hardware or without. The low profile design makes it easy to incorporate into any setup and gives the user the flexibility to define the setup. When combined with Aquarian inBOX (required) and your favorite drum module, the onHEAD is a cost-effective solution that transforms any acoustic drum set into a professional electronic drum kit. Just place it ON your own acoustic drums and get an E-kit with a custom look and exceptional triggering performance at a fraction of the cost of prepackaged professional electronic drum kits.